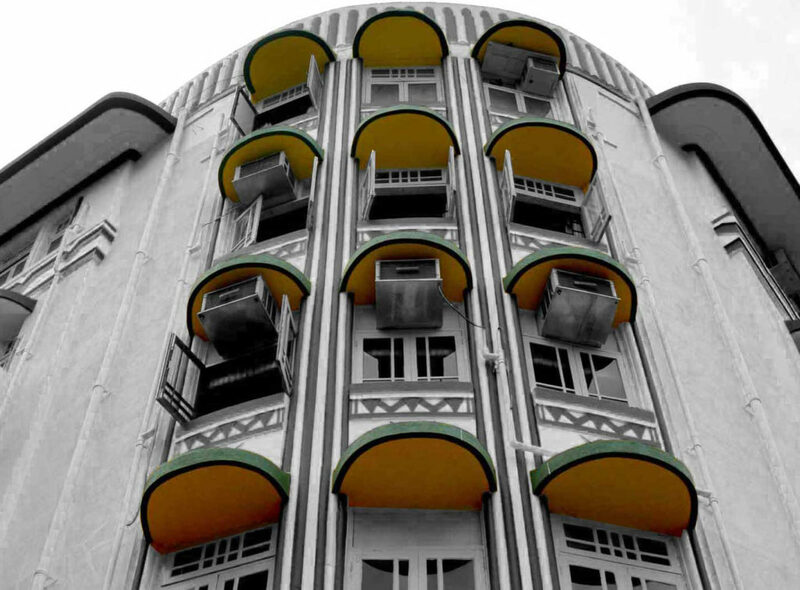 The Art Deco style first appeared in India when Indian royal families, entrepreneurs and merchants of the widely traveled educated upper middle class, eager to adopt contemporary trends in western culture, began to assume its sophistication in dress, furnishings and architectural design. 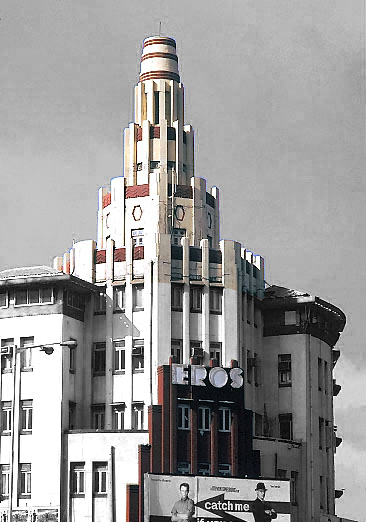 The elite group frequented London and Paris on English and French ocean liners attending various European Modern Events and Expositions from where the inspiration towards Modern Art deco culture originated. 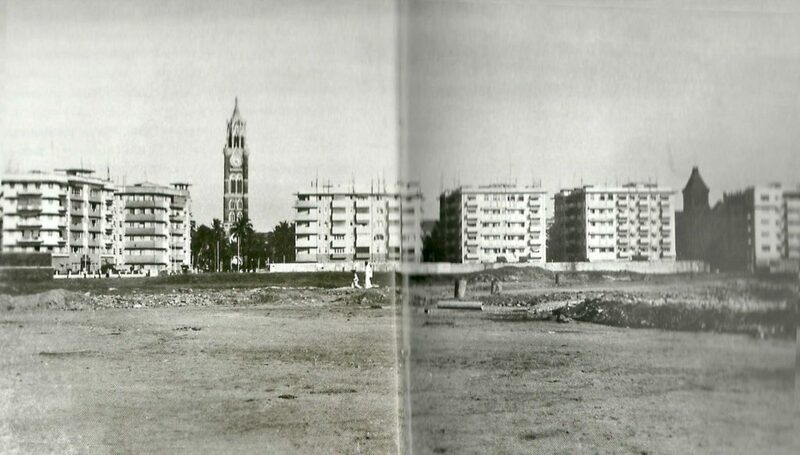 During the Art deco era, Bombay grew into an exciting and vibrant commercial hub. Poised between past and future, the city emerged internationally while still a jewel in the crown of the British Raj. 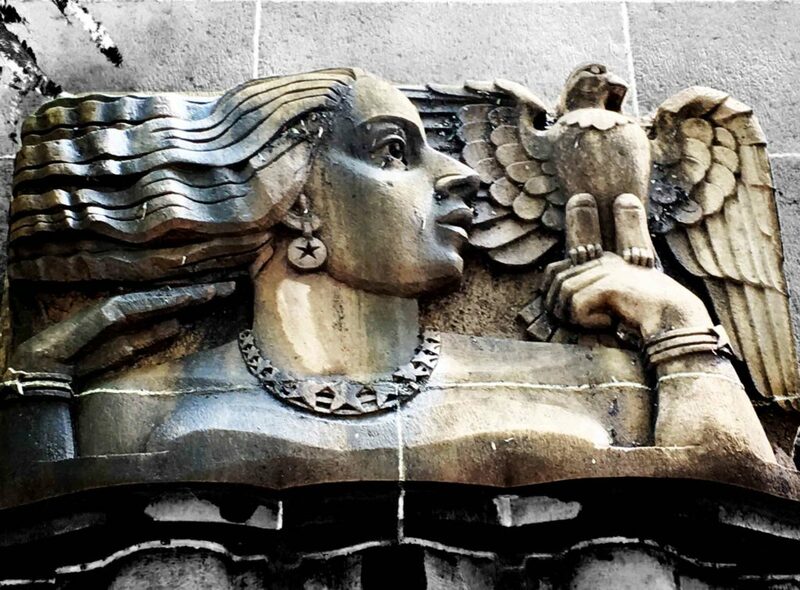 Art deco incorporated decorative themes and motifs facilitating continuity in expression or ornamentation critical for India. 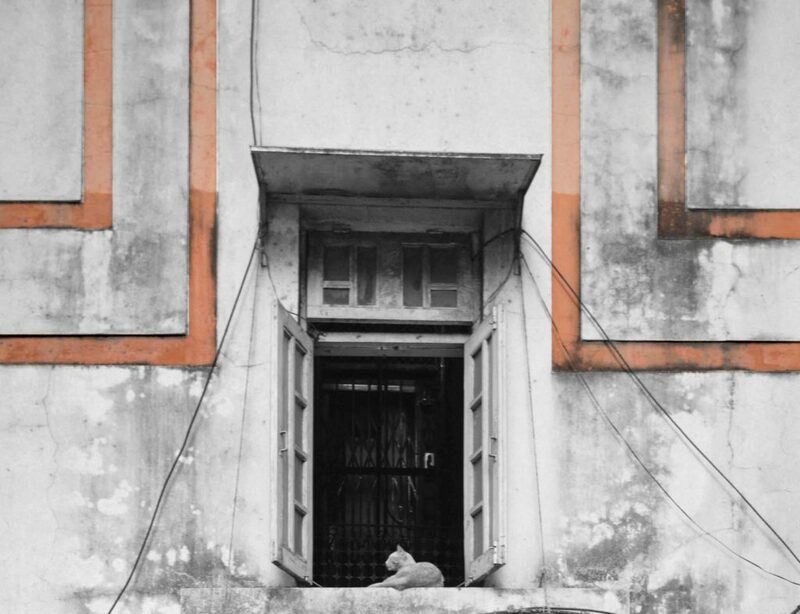 Although the style grew out of industrial means of production, in India the buildings continued to be constructed primarily with manual labour bringing to them a hand-made quality while also creating a highly skilled pool of labour that was familiar with the use of reinforced cement concrete construction. 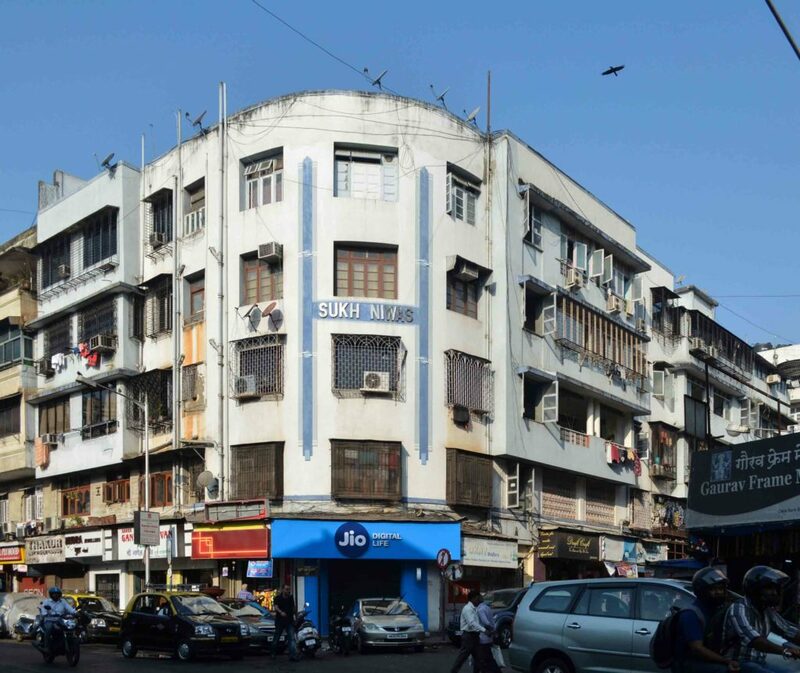 Buildings in Bombay manifested unique elements such as nautical features and stream lining, creating evidence of an era of Art deco in the city. 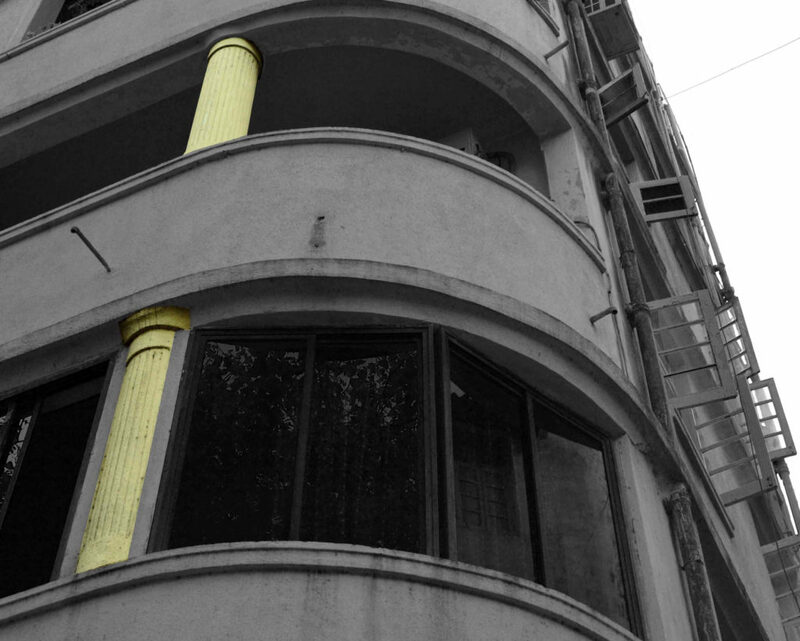 Technology allowed for construction to be built with Rounded Corners. In the 1930’s and 1940's, the design of airplanes, ships, trains, and automobiles influenced architecture. 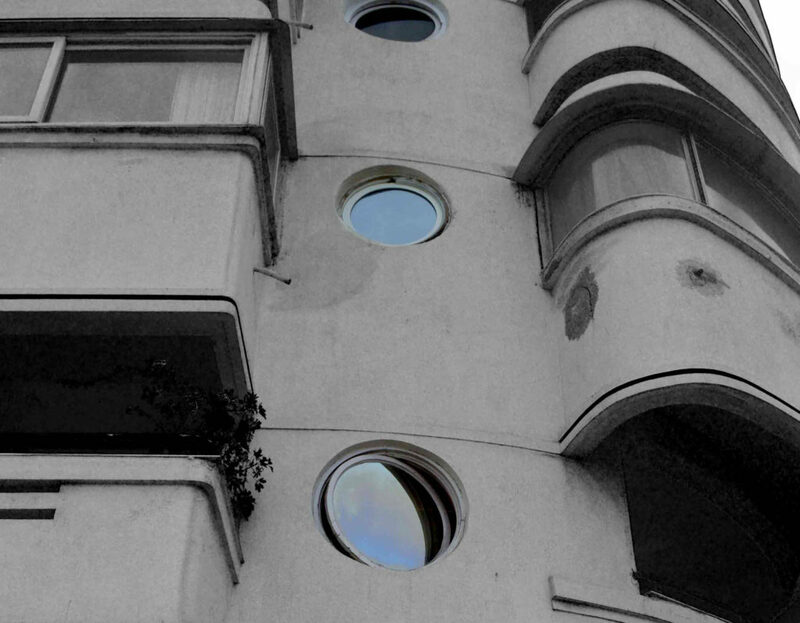 Rounded corners made buildings appear aerodynamic, fast, futuristic and sleek. The modern industrial era, which began in the 20th century, was obsessed with speed, especially that of the locomotive, airplane, automobile, and even the ocean liner. Streamlined designs expressed this passion in sleek surfaces, elongated forms and curvaceous contours. 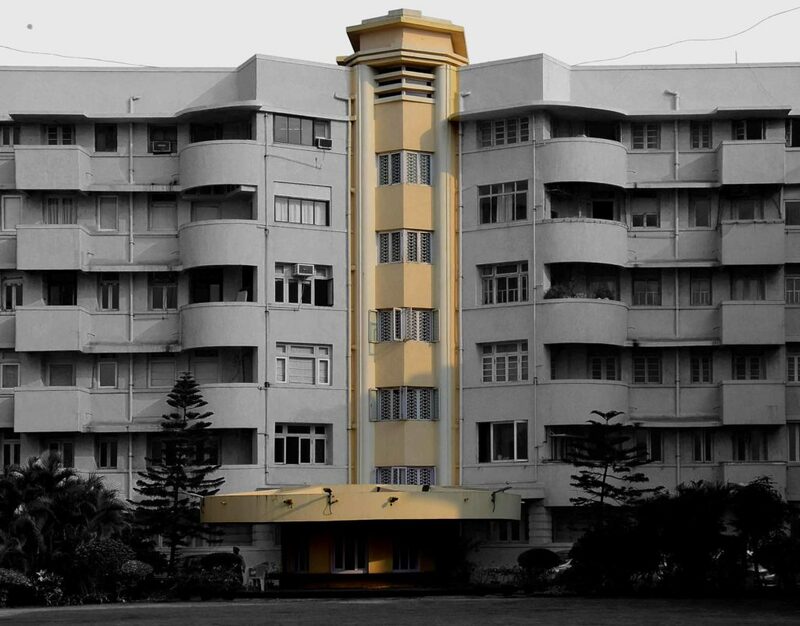 In Bombay streamlining was used to convey a look of sophistication and futurism in many Art deco buildings. 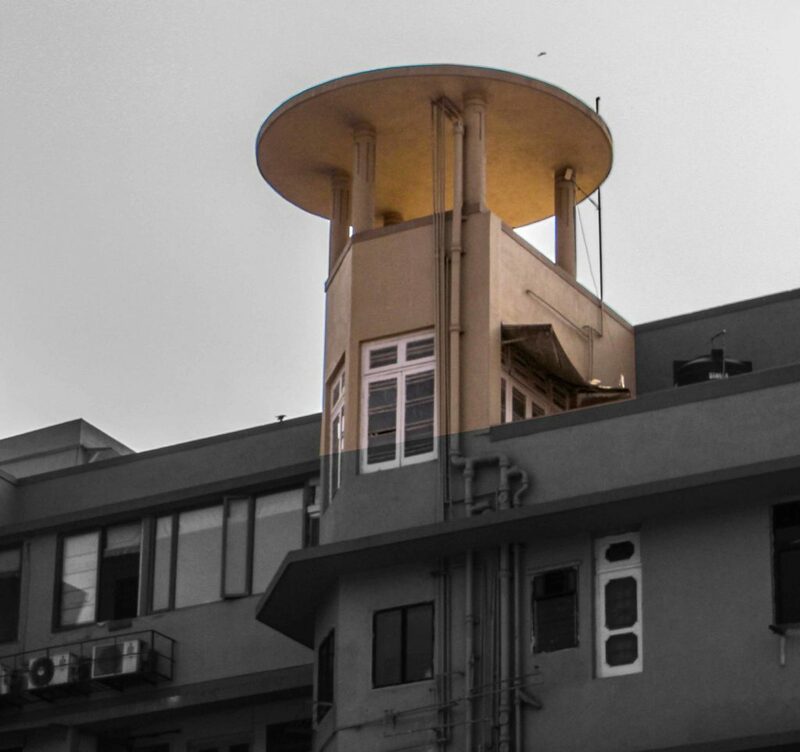 Being a port city, steamships influenced deco where buildings were manifested with nautical features such as porthole windows, ship deck-style railings and observatory towers. 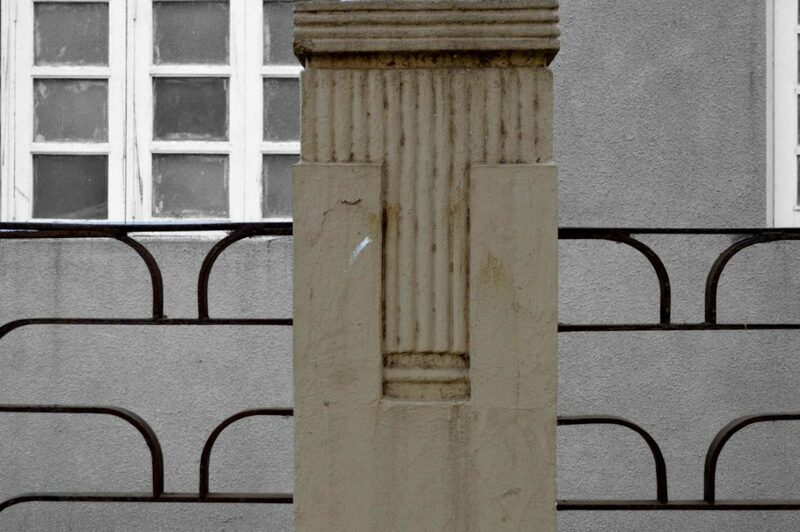 Horizontal banding on the facades of buildings, which can be incised or applied in decorative materials such as tile. Banding usually comes in group of "threes". 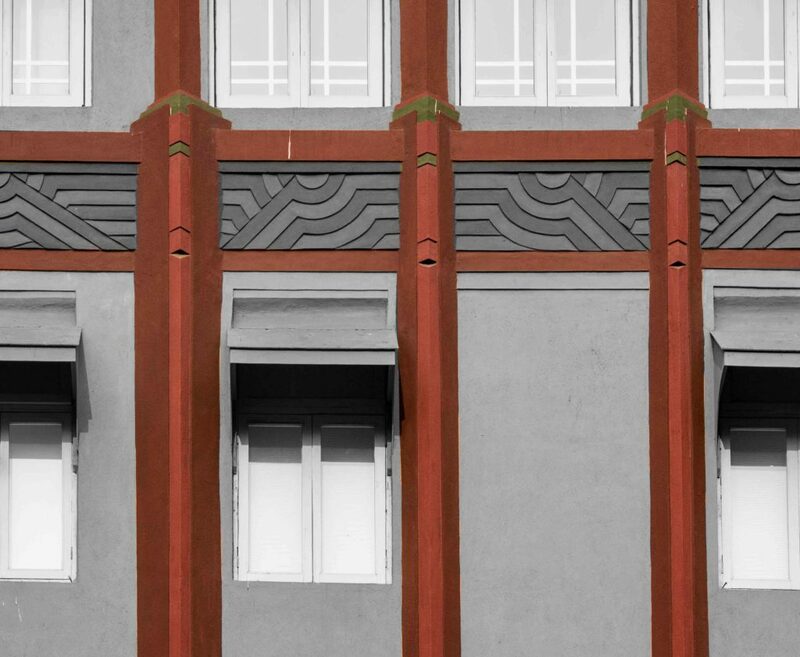 This simplified ornamentation reinforces aerodynamic concepts of Streamline Moderne. 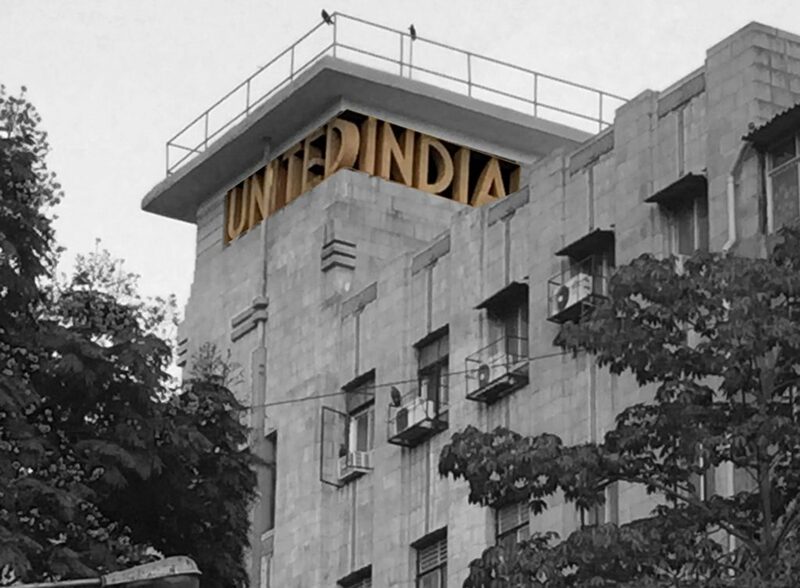 A great way to accent the architectural elements of an Art Deco building is to paint the banding in a contrasting colour used typically to accentuate verticality or horizontality. 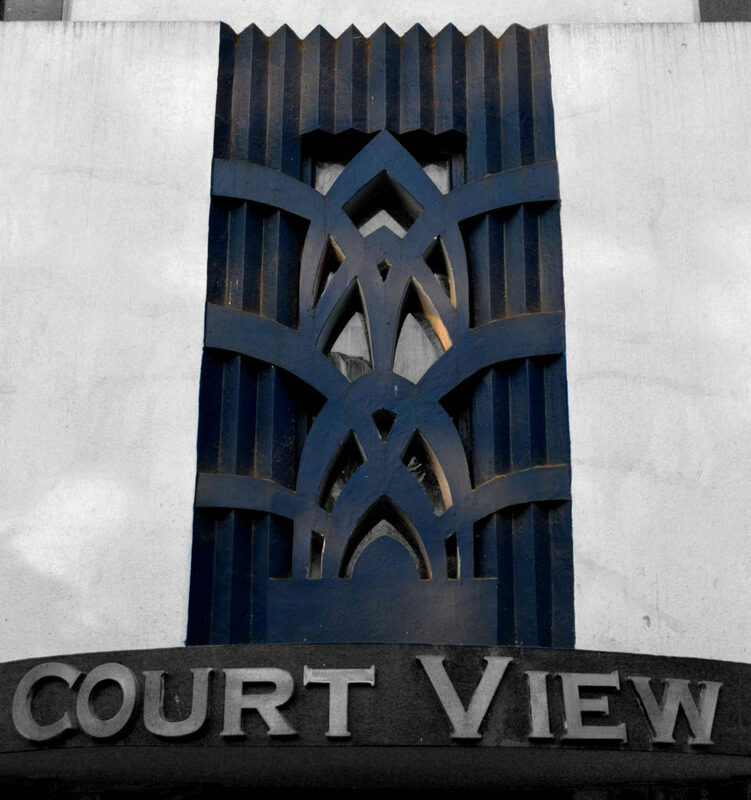 Many Art Deco buildings feature either whole columns, which stand away from the building or sliced columns attached to the front doorway facade acting as an archway. 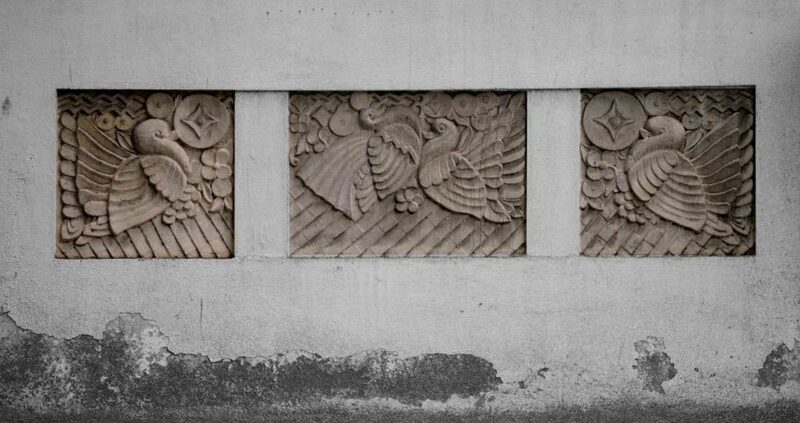 Scenes of toiling Indian farmers, hindu gods and goddesses, symbolic animals such as the elephant and figures from Indian mythology were often integrated into façade reliefs. 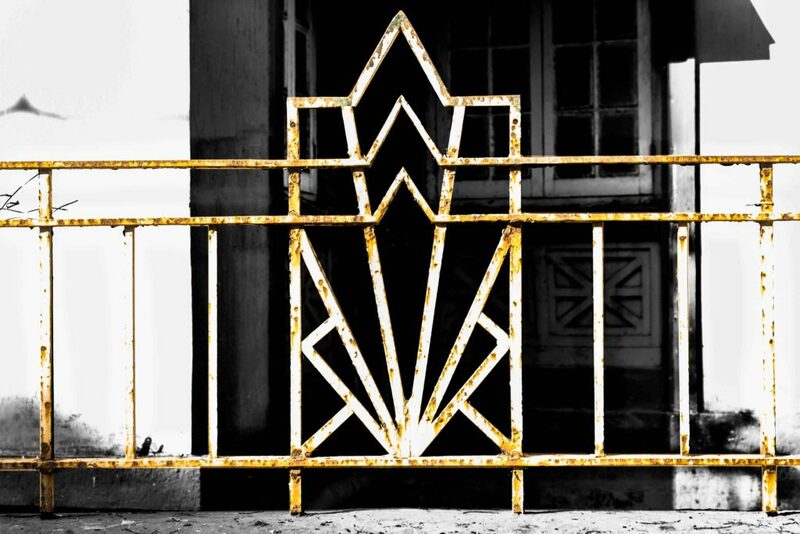 They introduced an Indian-deco character also known as Bombay Deco to the western influence of Art deco. 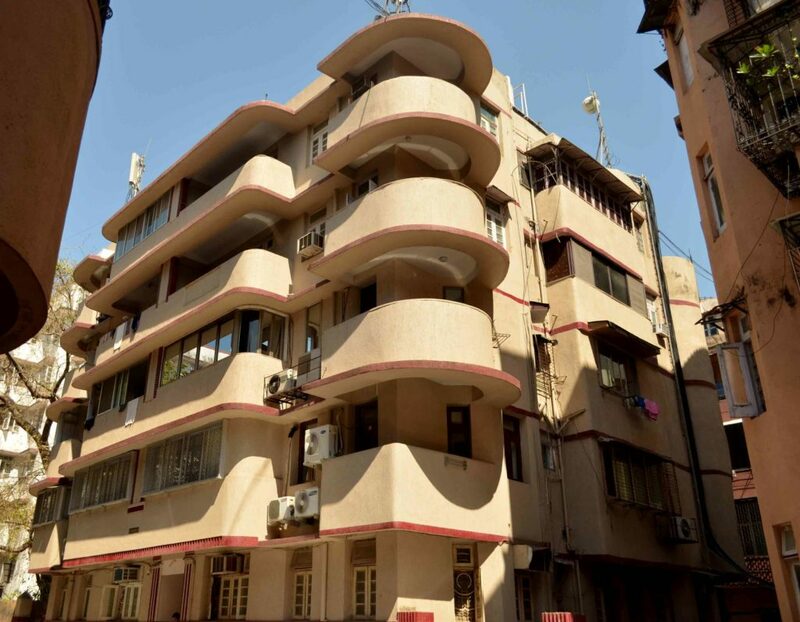 Bombay’s Art deco buildings were decorated with stylized forms of waves, Sunburst rays, tropical flora and fauna which is witnessed in Porch railings, Façade’s bas- relief, Metal balcony grilles and ornamental gates. 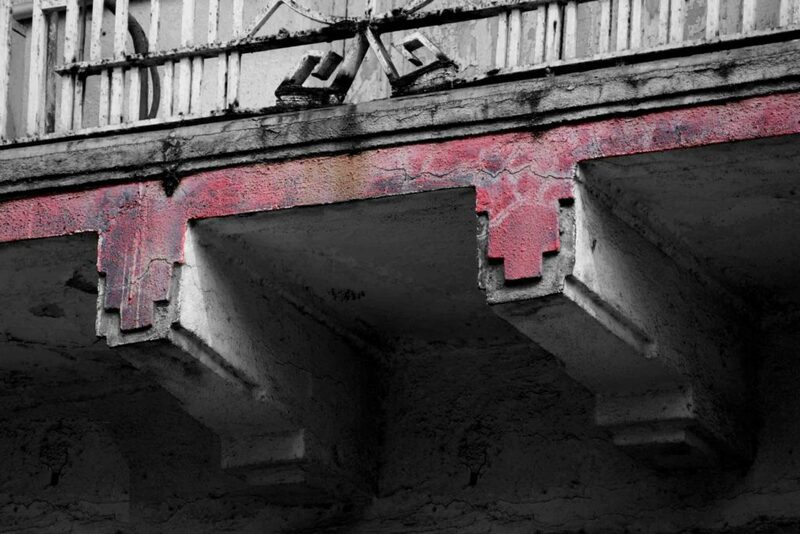 Following the symmetrical design, buildings are divided by the vertical central staircase tower which is highlighted with an observatory or clock on top or Deco iron grill work or motifs expressed as varying plaster bands that accentuate the entry gateway. Profiled like a staircase - Up Down, Up Down. Also known As "Zig-zag" Or "Lightning Bolt." Ziggurats are seen on the roofline of buildings recreating egyptian motifs. 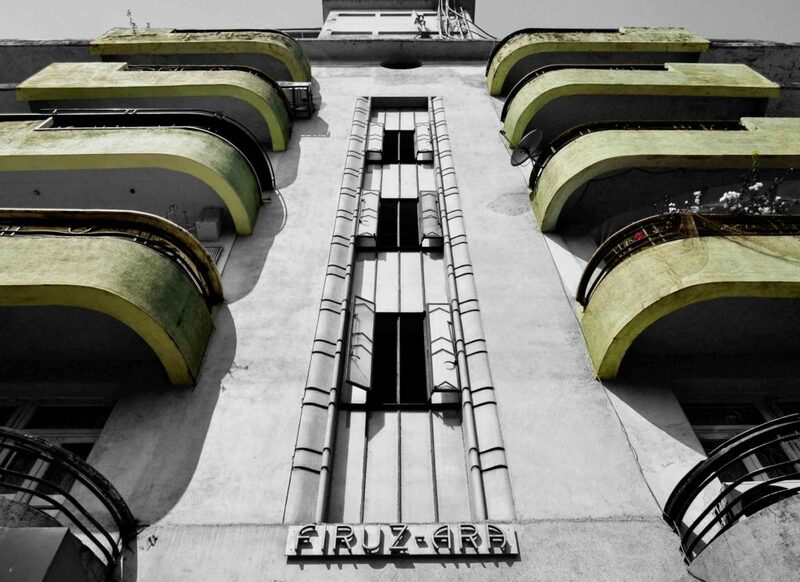 Art Deco or streamline buildings usually have a flat roof or multi-level flat roofs. 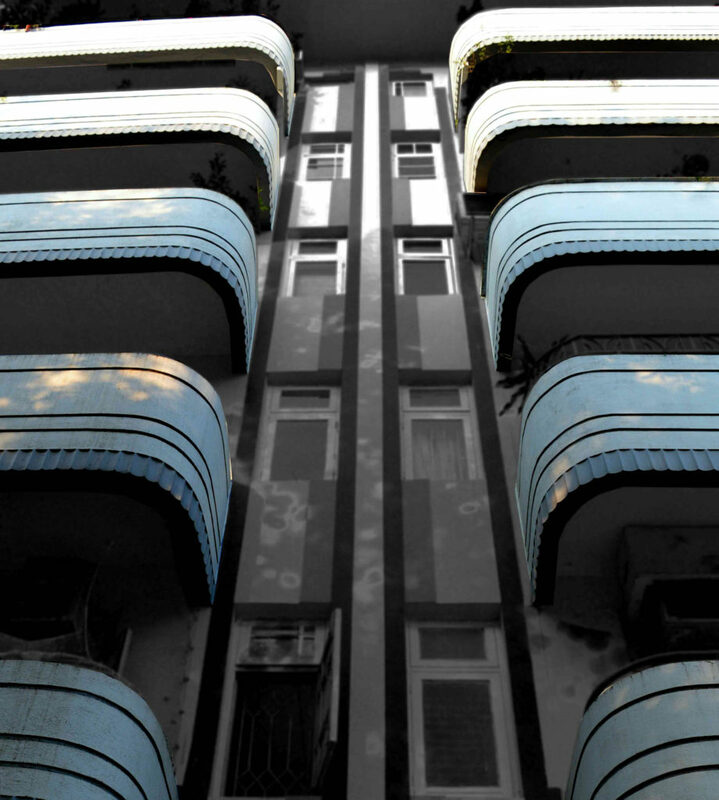 Cantilevered window shades included in the buildings structure. Eyebrows look like a "shelf" placed above a window. Eyebrows shade direct sunlight and keep the interior cool. 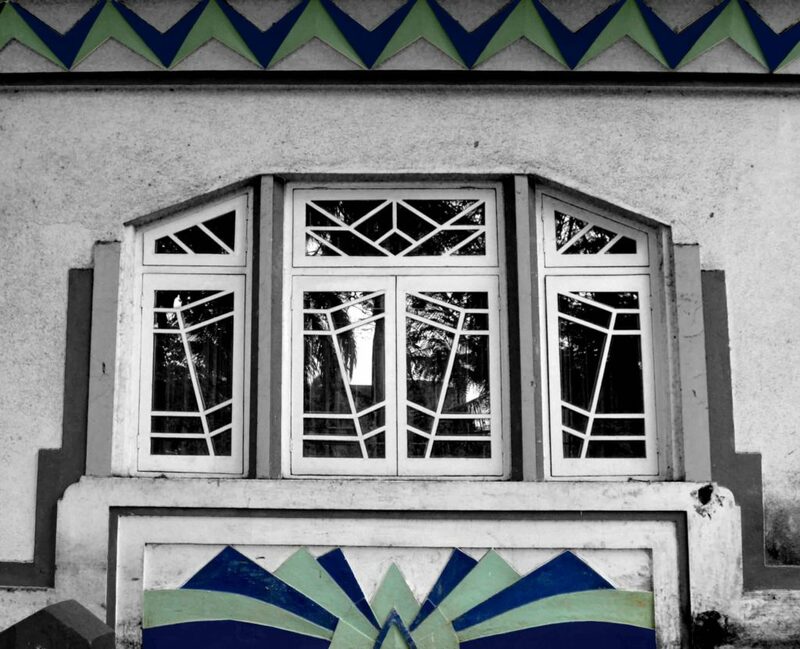 Most windows are adorned with expressive Deco grill work that is inspired directly from nature showcasing the sun, clouds, birds, waves, flowers, etc. 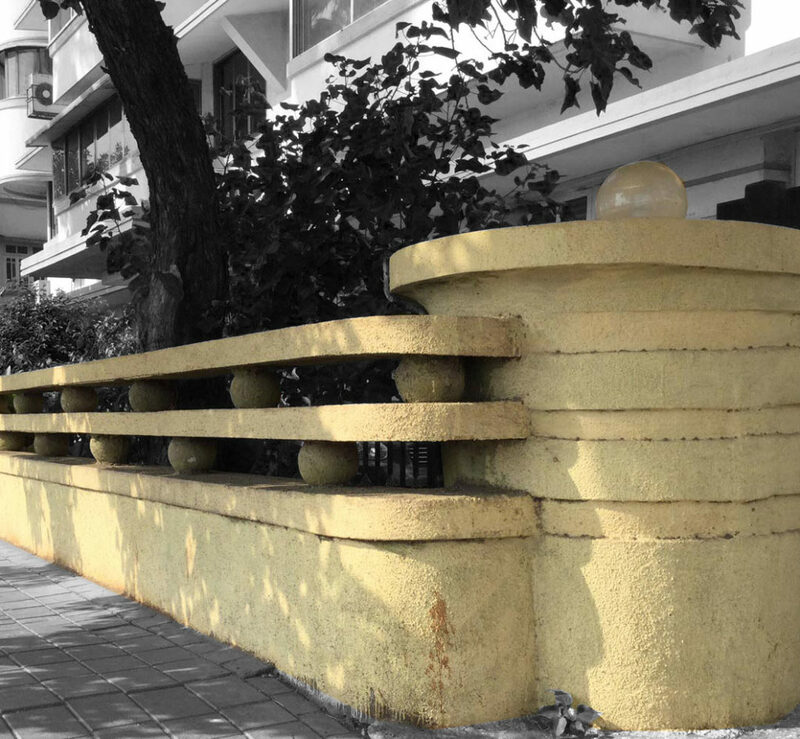 In Bombay’s Art deco, the frozen fountain became a prevalent decorative feature in building facades and metal grilles. Frozen fountain, a historical symbol of eternal life, was re popularized by Rene` Lalique in 1925 at the Paris Exposition. 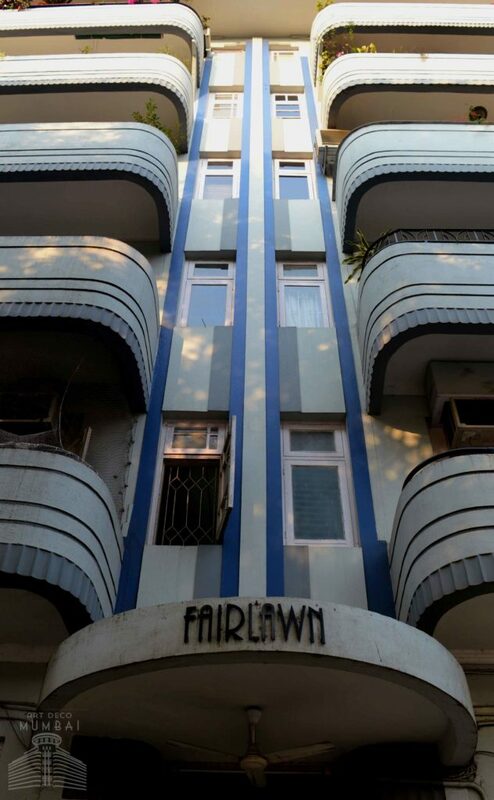 Fonts represented sleekness became a style in Bombay’s Art Deco era. 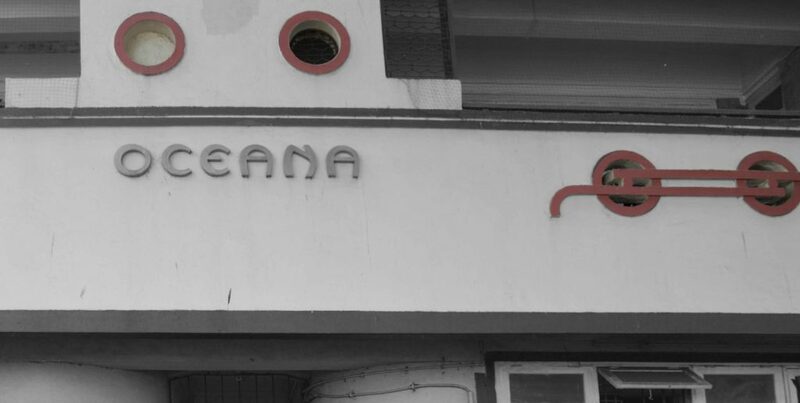 Lettering took on the streamlined elegance of the architecture and appeared in a variety of mediums including stucco, metal, wood and stone. 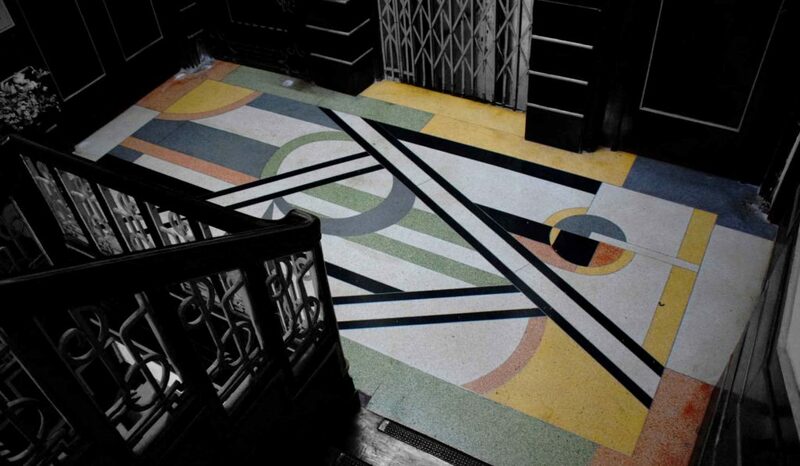 Geometric expression was at its most vivid in the flooring of Bombay art deco residences. 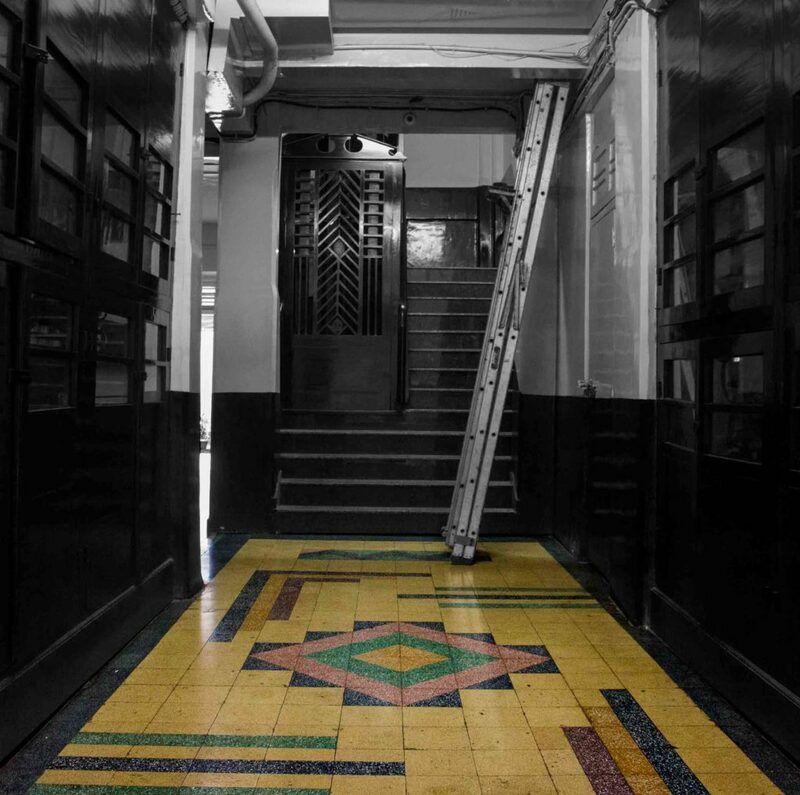 Jazz age patterns and rhythmic design motifs were executed in marble as well as in terrazzo, an aggregate of concrete and marble chips commonly referred as ‘Mosaic’ in India. 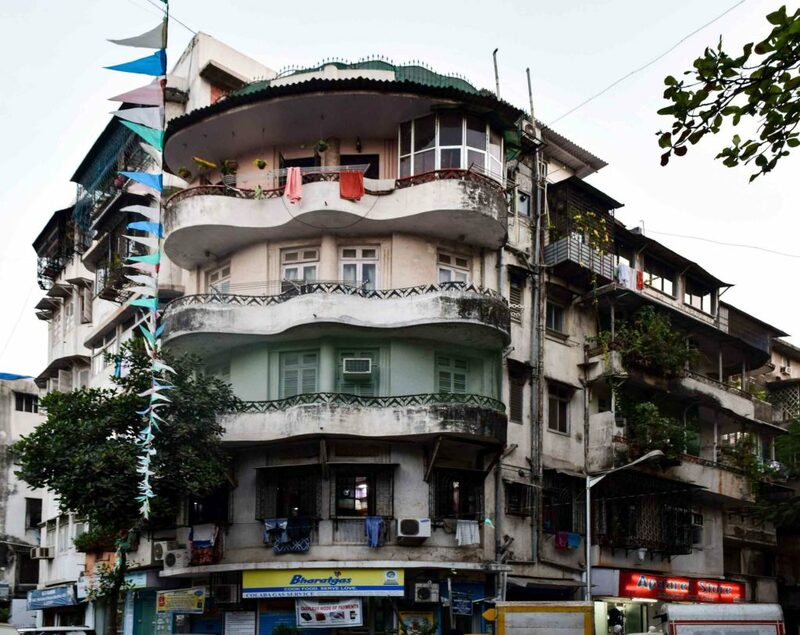 Semi-transparent, lower than eye-level in design, comprised of basic elementary shapes are manifested in compound walls of Bombay’s Art deco buildings. Influence of style is also represented in iron gates and compound wall lights.